I have three DJ gigs this week. Here are the details. There’s a venue in North Hollywood called the California Institution of Abnormal Arts (CIA). It’s on one of those big, Valley boulevards that practically beg for you to speed along without a second glance. But this spot, set back only a bit from the street, is marked by a clown on the gate and a clown on the front door. 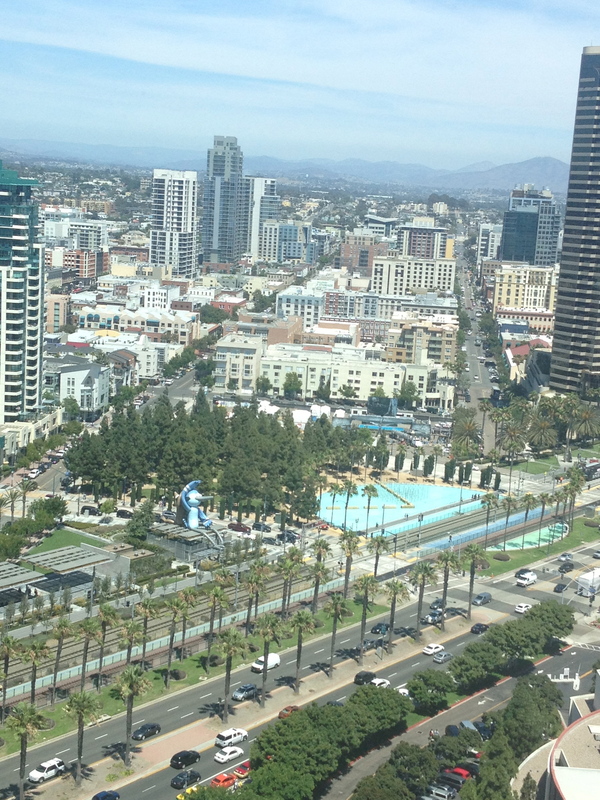 They aren’t as eye-catching as the big, polka-dot guy atop Circus Liquor a few blocks east, but you will notice them. I have plenty of times before Saturday night, but for some odd reason or other, never stopped to peek inside. I’ve actually had friends, a lot of them, play here and yet, it wasn’t until two nights ago that I made the trip here. Clearly, I have been missing out on something special. CIA is the coolest venue I’ve seen in the Valley. It appears small, even after you walk inside. 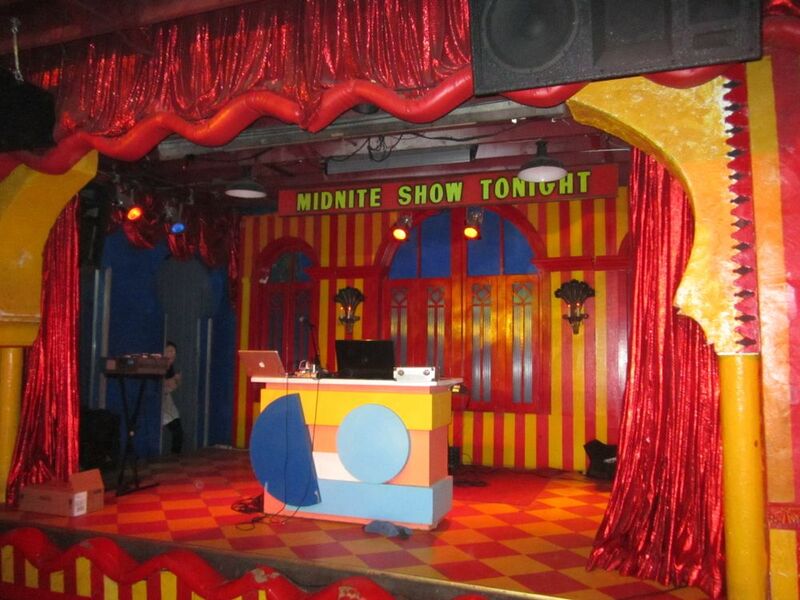 The actual performance area is roughly comparable in size to an itty-bitty punk club. It’s a little rough around the edges too. Look closely and you’ll find tiny cracks in the patterns on the floor of the stage. The scruffiness goes with the decor, which is a mix of oddball vintage finds. There are old mannequins done up in bizarre fashion, skills, dolls heads and lots of candles. The more you explore, the more bizarre this space is. I have a few DJ gigs coming up on the horizon. Here are the details. I’m back at Underground this Friday night and we’re doing a tribute to one of our Britpop heroes, Jarvis Cocker. Larry, Diana and I will be playing our favorite Pulp tracks, plus a lot of other hits from the U.K. and beyond. RSVP on Facebook or through Underground’s website for free entry before 10 p.m. and $5 entry thereafter. Without an RSVP, the cover is $8. On Saturday afternoon, I’ll be back at the Grand Star with a few stacks of vinyl for Beat Swap Meet. This is one of my favorite events in L.A., a record swap meet that takes over Chinatown every couple months, and was so excited that I was asked to play for this event. I should be on the decks at around 3:45 upstairs at the Grand Star. Even more exciting is that Free Moral Agents is playing live. Make sure you catch their set. Beat Swap Meet is free with a canned good donation. Check out Facebook for more info on the event. 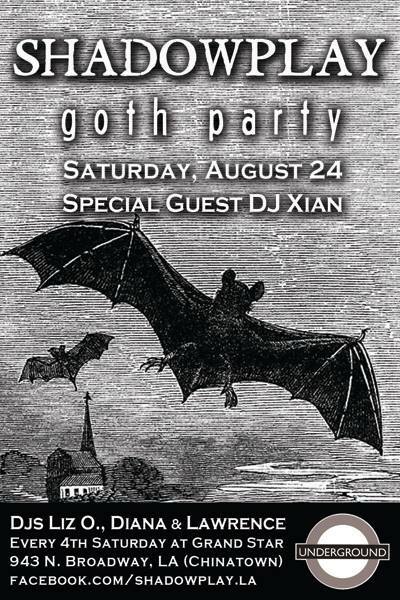 Remember how we did a couple goth nights at Underground? The response was so good that we decided to let Shadowplay go off on its own. 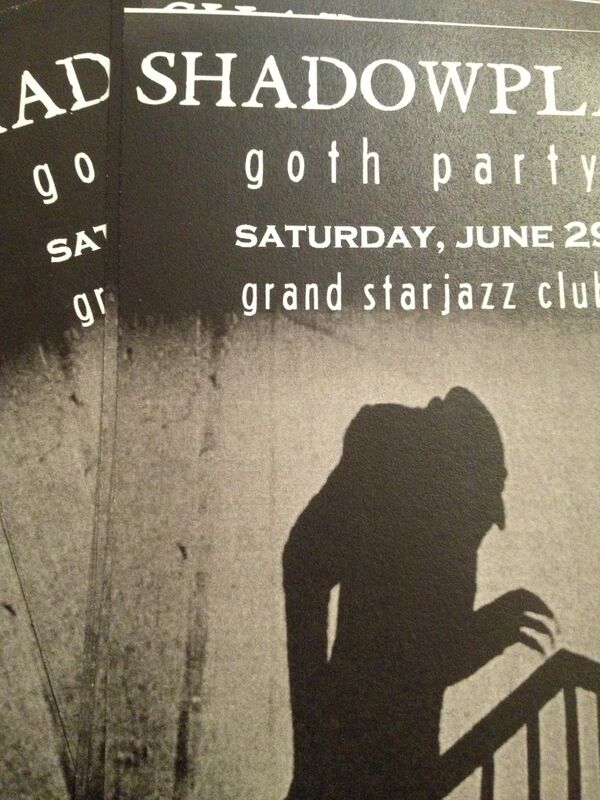 Our first proper Shadowplay party is June 29 at the Grand Star in Chinatown. Larry, Diana and I will be digging into our record collections once again for the spookiest tunes we own. 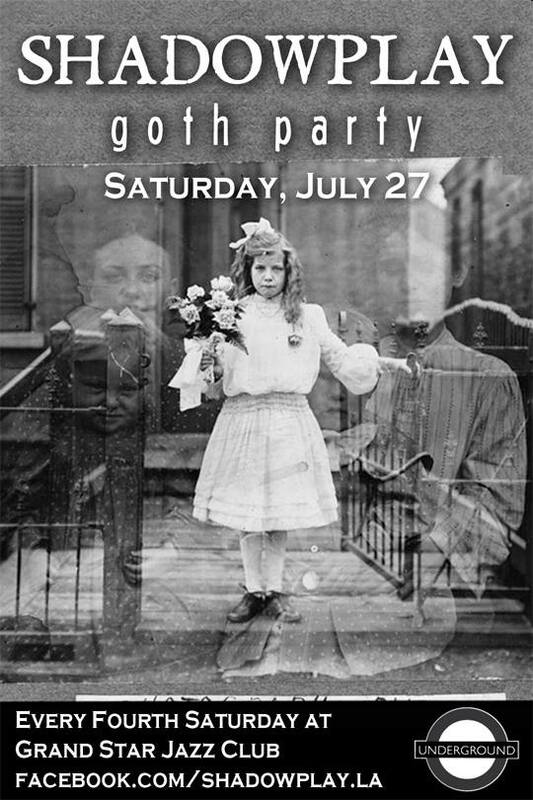 RSVP on Facebook or through Underground’s website to get in for free before 10 p.m. Otherwise, the cover is $8 all night. This is a ways off, but you might as well mark your calendar now. 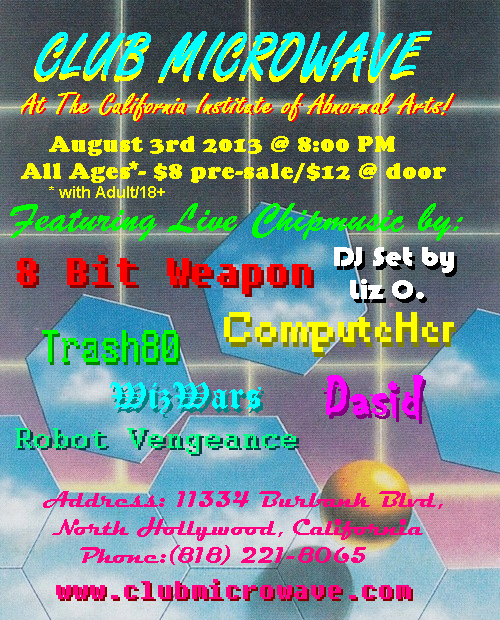 I’m DJing at Club Microwave on August 3. This is a cool event from the fine people behind 8 Bit Weapon and ComputeHer and I’m excited to be playing it. RSVP on Facebook. 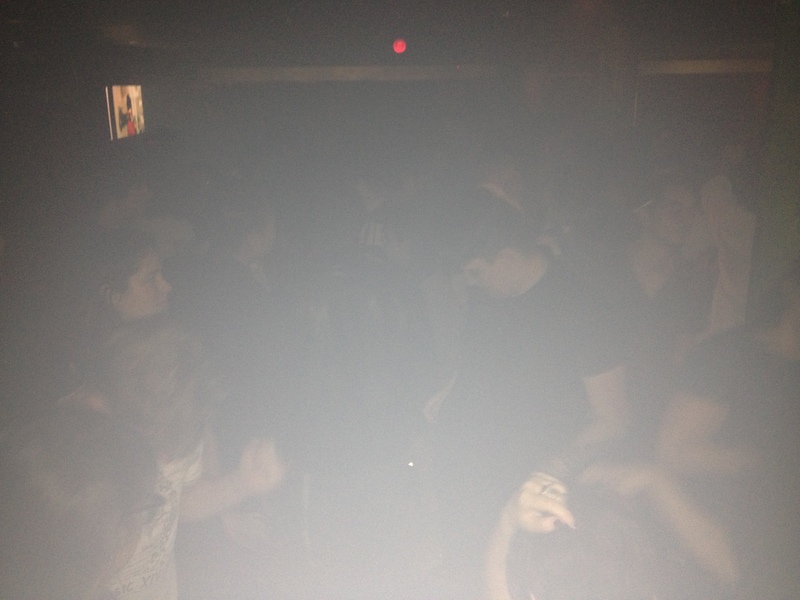 Last night, I played Zerox, a monthly party at La Cuevita in Highland Park. It’s an ’80s night, but not your standard one. Resident DJs Eric Dead and Ralphie Nigma play a lot of interesting punk, goth, new wave, ska, etc. I took the opportunity to bust out some tunes that I don’t normally play in my sets, along with some of my favorite hits. Thanks to Eric and Ralphie for having me play last night. Also, thank you to those of you who made it out to the party. It was a great time!